Johann Dzierzon, or Jan Dzierżon [ˈjan ˈd͡ʑɛrʐɔn] or Dzierżoń [ˈd͡ʑɛrʐɔɲ], also John Dzierzon (16 January 1811 – 26 October 1906), was a pioneering Polish apiarist who discovered the phenomenon of parthenogenesis in bees and designed the first successful movable-frame beehive. His discoveries and innovations made him world-famous in scientific and bee-keeping circles, and he has been described as the "father of modern apiculture". Dzierzon came from Upper Silesia. Born into a family of ethnic Polish  background which did not speak German but a Silesian dialect of the Polish language, he has been variously described as having been of Polish, German, or Silesian nationality. Dzierzon himself wrote: "As for my nationality, I am, as my name indicates, a Pole by birth, as Polish is spoken in Upper Silesia. But as I came to Breslau as a 10-year-old and pursued my studies there, I became German by education. But science knows no borders or nationality." It was at gymnasium and at the theological faculty that he became acquainted with German scientific and literary language, which he subsequently used in his scientific writings, rather than his native Polish-Silesian dialect. He used Silesian-Polish in some press publications, in his private life, and in pastoral work, alongside literary Polish. 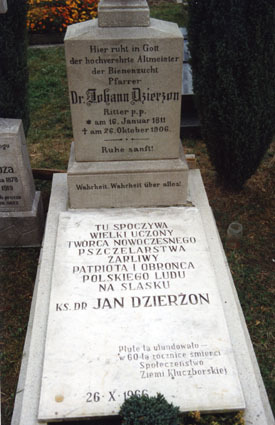 Dr. Jan Dzierzon considered himself a member of the Polish nation. Dzierzon's manuscripts, letters, diplomas and original copies of his works were given to a Polish museum by his nephew, Franciszek Dzierżoń. Following the 1939 German invasion of Poland, many objects connected with Dzierzon were destroyed by German gendarmes on 1 December 1939 in an effort to conceal his Polish roots. The Nazis made strenuous efforts to enforce a view of Dzierżoń as a German. Dzierzon was born on 16 January 1811 in the village of Lowkowitz (Polish: Łowkowice), near Kreuzburg (Kluczbork), where his parents owned a farm. He completed Polish elementary school before he was sent to a Protestant school located a mile from his village. In 1822 he moved to Breslau (Wrocław), where he attended middle school (gymnasium). In 1833 he graduated from the Breslau University Faculty of Catholic Theology. In 1834 he became chaplain in Schalkowitz (Siołkowice). In 1835, as an ordained Roman Catholic priest, he took over a parish in Karlsmarkt (Karłowice), where he lived for 49 years. In his apiary, Dzierzon studied the social life of honeybees and constructed several experimental beehives. In 1838 he devised the first practical movable-comb beehive, which allowed manipulation of individual honeycombs without destroying the structure of the hive. The correct distance between combs had been described as 1½ inches from the center of one top bar to the center of the next one. In 1848 Dzierzon introduced grooves into the hive’s side walls, replacing the strips of wood for moving top bars. The grooves were 8 × 8 mm—the exact average between ¼ and ⅜ inch, which is the range called the "bee space." His design quickly gained popularity in Europe and North America. On the basis of the aforementioned measurements, August Adolph von Berlepsch [de] (May 1852) in Thuringia and L.L. Langstroth (October 1852) in the United States designed their frame-movable hives. In 1835 Dzierzon discovered that drones are produced from unfertilized eggs. Dzierzon's paper, published in 1845, proposed that while queen bees and female worker bees were products of fertilization, drones were not, and that the diets of immature bees contributed to their subsequent roles. His results caused a revolution in bee crossbreeding and may have influenced Gregor Mendel's pioneering genetic research. The theory remained controversial until 1906, the year of Dzierzon's death, when it was finally accepted by scientists at a conference in Marburg. In 1853 he acquired a colony of Italian bees to use as genetic markers in his research, and sent their progeny "to all the countries of Europe, and even to America." In 1854 he discovered the mechanism of secretion of royal jelly and its role in the development of queen bees. With his discoveries and innovations, Dzierzon became world-famous in his lifetime. He received some hundred honorary memberships and awards from societies and organizations. In 1872 he received an honorary doctorate from the University of Munich. Other honors included the Austrian Order of Franz Joseph, the Bavarian Merit Order of St. Michael, the Hessian Ludwigsorden, the Russian Order of St. Anna, the Swedish Order of Vasa, the Prussian Order of the Crown, 4th Class, on his 90th birthday, and many more. He was an honorary member of the German Academy of Sciences Leopoldina. He also received an honorary diploma at Graz, presented by Archduke Johann of Austria. In 1903 Dzierzon was presented to Emperor Franz Joseph I of Austria. In 1904 he became an honorary member of the Schlesische Gesellschaft für vaterländische Kultur ("Silesian Society for Fatherland Culture"). In every direction, one has a broad and pleasant view, and I am pretty happy here, despite the isolation, as I am always close to my beloved bees — which, if one's soul be receptive to the works of the Almighty and the wonders of nature, can transform even a desert into a paradise. Johann Dzierzon is considered the father of modern apiology and apiculture. Most modern beehives derive from his design. Due to language barriers, Dzierzon was unaware of the achievements of his contemporary, L.L. Langstroth, the American "father of modern beekeeping", though Langstroth had access to translations of Dzierzon's works. Dzierzon's manuscripts, letters, diplomas and original copies of his works were given to a Polish museum by his nephew, Franciszek Dzierżoń. In 1936 the Germans renamed Dzierzon's birthplace, Lowkowitz, Bienendorf ("Bee Village") in recognition of his work with apiculture. At the time, the Nazi government was changing many Slavic-derived place names such as Lowkowitz. After the region came under Polish control following World War II, the village would be renamed Łowkowice. After World War II, when the Polish government assigned Polish names to most places in former German territories which had become part of Poland, the Silesian town of Reichenbach im Eulengebirge (traditionally known in Polish as Rychbach) was renamed Dzierżoniów in the man's honor. In 1966 a Polish-language plate was added to his German-language tombstone. 15 November 1845: Chodowanie pszczół - Sztuka zrobienica złota, nawet z zielska, in: Tygodnik Polski Poświęcony Włościanom [pl], Issue 20, Pszczyna (Pless). ^ "britannica.com". britannica.com. Retrieved 2013-10-09. ^ Cimała, Bogdan (1992). "Kluczbork: dzieje miasta (Kluczbork, City History)". Instytut Śląski. ^ a b Stanisław Feliksiak, Słownik biologów polskich, Polish Academy of Sciences Instytut Historii Nauki, Oświaty i Techniki, Państwowe Wydawnictwo Naukowe, 1987, p. 149. ^ Dados, Danuta; Tomaszewski, Roman. "Historia znana i nieznana. Materiały do dziejów pszczelnictwa w Polsce - Ślązak Cz. II". Pasieka (in Polish and German). Archived from the original on 2012-03-05. Retrieved 27 March 2010. ^ Kwartalnik opolski, vol. 31, Opolskie Towarzystwo Przyjaciół Nauk, 1985, p. 86. ^ a b Danuta Kamolowa, Krystyna Muszyńska, Zbiory rękopisów w bibliotekach i muzeach w Polsce, Biblioteka Narodowa (Polish National Library, p. 68. ^ a b Mówią wieki: magazyn historyczny (The Ages Speak: Magazine of History, [published by] the Polish Historical Society), vol. 23 (1980), p. 26. ^ a b "Komunikaty: Seria monograficzna, tomy 2-11". Instytut Śląski w Opolu. 1960. p. 138. Archived from the original on 2010-07-22. ^ Zygmunt Antkowiak, Patroni ulic Wrocławia, Zakład Narodowy im. Ossolińskich, 1982. ^ a b c d e f g Dados, Danuta; Tomaszewski, Roman. "Pasieka (Apiary) 1/2007. Historia znana i nieznana. Materiały do dziejów pszczelnictwa w Polsce - Ślązak Cz. II" (in Polish). pasieka.pszczoly.pl. Retrieved 27 March 2010. ^ Everett Mendelsohn; Garland E. Allen (2002). Science, history, and social activism. Springer. ISBN 978-1-4020-0495-7. ^ Alfred Henry Sturtevant; Edward B. Lewis (2001). A history of genetics. CSHL Press. ISBN 978-0-87969-607-8. ^ Eva Crane. The world history of beekeeping and honey hunting. Taylor & Francis. ISBN 978-0-415-92467-2. ^ "Meyers Konversations-Lexikon, 4th edition" (in German). 5. Leipzig. 1885–89: 268. Retrieved February 6, 2007. ^ "kluczbork.pl". kluczbork.pl. Archived from the original on 2014-06-03. Retrieved 2013-10-09. ^ a b Crane, Eva (1999). The world history of beekeeping and honey hunting. Taylor & Francis. p. 421. ISBN 978-0415924672. ^ Cincinnati Historical Society; Cincinnati Museum Center; Filson Historical Society (2005). Ohio Valley history. The journal of the Cincinnati Historical Society. 5–6. Cincinnati Museum Center. p. 96. ^ Crane, Eva (1999). The world history of beekeeping and honey hunting. Taylor & Francis. pp. 421–422. ISBN 0415924677. ^ "Niemcy "przechrzcili” miejscowość znaną pod polską nazwą w całym świecie (Łowkowice = Bienendorf)", Ilustrowany Kuryer Codzienny, no. 280, 8 October 1936. ^ "Dzierżoniów". Britanica Encyclopaedia, 15th edition. p. 312. Retrieved January 23, 2007. ^ "Muzeum im. Jana Dzierżona w Kluczborku". Kluczbork.pl. Archived from the original on 2014-06-03. Retrieved 2013-10-09. Wikimedia Commons has media related to Johann Dzierzon. This page was last edited on 26 February 2019, at 13:38 (UTC).